How did a school district migrate thousands of users to Windows 10 in a few days? Each of these organizations needed to map and update dozens of apps and drivers to the appropriate users and PCs, plus restore each user's data and settings. FYI, the healthcare organization came in ahead of budget. And the school system? Well, it finished a week ahead of an aggressive schedule. Use the migration to upgrade your processes—improve your provisioning, patching, and software license compliance processes. Provision new or existing devices using templates that minimize configuration steps. 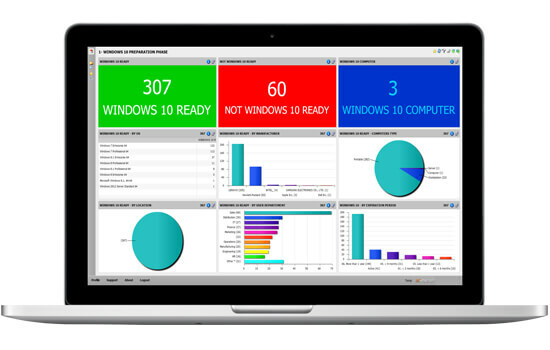 Have users up and running with fewer incidents. Simplifies file sync, storage, and migration. Cut the time and cost of application-package customization by decoupling application settings from the package itself. Automate app configurations based on the destination OS and elevate user privileges dynamically to install. Track all licenses from the time of the new installation. Capture the user profile from existing desktops automatically and store the data centrally, then re-apply it on-demand. Leverage the user profile to apply during a migration to a particular device, or as part of a roaming profile to use on any machine running any Windows OS. There's no need for multiple images in order to migrate machines of varying models or manufacturers. Use a simpler, standardized image, then let the solution lay down the device-specific drivers, apps, and profiles related to the user. Update new or existing devices using provisioning templates that minimize PC configuration steps and propel your IT team to new levels of efficiency. Gain the flexibility to download device drivers based on PC or device type and have users up and running with fewer incidents.